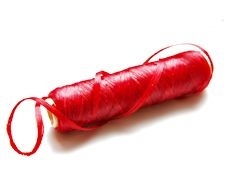 Red imitation sinew 15 lb test waxed poly thread. Sinew length - 20 yards before splitting. 2oz spool. This sinew splits into five strands. This is enough for several craft projects if you split it.